Given all the hullabaloo raised recently by the crazy astrologists recreating the signs of the zodiac, I thought I'd take a gander at the updates. I'm still a Virgo. Which means, no matter what millennium I decide to visit, my traits shall remain the same. I don't buy into these shenanigans, but I do find them intriguing to peruse. What are these traits? I've pasted them below. Do you agree with them? Is this me? I find one blatant contradiction and the rest are so spot-on I am quite shocked...I mean, these are secrets about me no one is supposed to know! Virgos are hardworking, reliable, logical and highly intellectual. Most have sharp minds and a strong work ethic. Virgos have a knack for detail work and sorting and organizing both information and objects. They tend to compartmentalize things in their own minds and to view the world through an analytical lens. As a result, Virgos are rational, practical and adaptable. However, on the negative side, they have a tendency to fuss over little details and in some cases suffer from obsessions and compulsions. Many Virgos have talents in science, linguistics or mathematics. They tend to excel in medicine, biology, nutritional science, editing, writing or accounting, and are often good at crossword puzzles and other word-related pursuits. Additional Virgo talents include design and research. Virgos are perfectionists and whatever they do, they need to do it thoroughly and get it exactly right or they feel dissatisfied. Intelligence, modesty and diplomacy enable Virgos to get along well with most people, though they like to spend time alone and may prefer the company of animals to that of people, unless they have many fire or air signs in their natal charts. Even the more extroverted Virgos will usually hang back in social situations until they’ve assessed the people around them. They don’t like to put themselves forward until they know what sort of people they’re dealing with. Virgos are cautious in most of their endeavors. They like to examine all variables before making decisions, and they are slow to trust because they don’t like to be vulnerable. Because of this, Virgos don’t fall in love easily and they are very choosy about their mates and friends. They are drawn to people through intellectual curiosity rather than shallow physical attraction or passion. Virgos need intellectual stimulation, and will quickly grow bored in the company of those who make small talk rather than speaking of serious, important things. Virgos are cautious with their money. They live frugally and don’t make frivolous expenditures, unless the ascendant falls in a more extravagant sign. Purchases are usually well thought out rather than made on a whim. 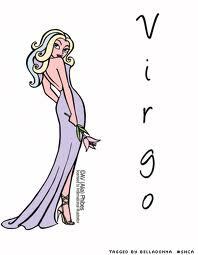 Virgos deal with stress by working on things, making things, cleaning things or analyzing things rather than by shopping. Virgos can be critical of others and incredibly hard on themselves. As a result, most can be relied on to keep their promises and fulfill their obligations, and they have little tolerance for those who cannot. Virgos prefer to have exceptionally clean houses and clothing. Most shower or bathe and wash their hands more frequently than other people. They tend to take good care of their belongings and clothing, and dress somewhat conservatively or in comfortable, practical clothing rather than flashy outfits. Virgos are health conscious and most follow modern research that relates to diet, nutrition, vitamins, and in some cases, herbology and naturopathic medicine. Virgos are prone to worrying, agonizing over things, and in extreme cases, hypochondria or germ phobia. However, for the most part they show common sense in all health-related behaviors. Virgos have fluctuating health and under stress can suffer from anxiety attacks and digestive difficulties. Bad nerves are a common Virgo affliction. Virgos are very cool under pressure and thus are great people to have around in a crisis. Oddly enough, they actually deal better with adverse circumstances than minor irritations. Virgos have a strong desire to serve a good cause, and for this they can labor intensively, even for little reward. Many do charity or volunteer work, and others are drawn to medical, caretaking and rehabilitative jobs. Virgos have a strong need to be needed and a talent for healing the sick, giving good practical advice and assistance, and solving problems for others. Their advice is usually worth following because it tends to be based on a thoughtful analysis of the pros and cons of a potential course of action rather than a knee-jerk emotional reaction. Virgos are willing and able to take on difficult jobs. They have a lot of endurance and under the most traumatic of circumstances they can appear calm, cool and collected. Though most people wouldn’t guess it, many Virgos are actually quite anxious or self-conscious, but they maintain good poker faces. Virgo intellectual detachment prevents emotions from shaping actions, which usually keeps fights and destructive impulses to a minimum, unless the ascendant falls in a more passionate sign. However, this exceptional self control can make Virgos appear cold, and this perception is exacerbated by the Virgo ability to walk away from relationships suddenly without looking back. Because they tend not to show emotion or express their feelings openly, when Virgos are unhappy in a situation, their partners may not know until it is too late. And Virgos disentangle from people relatively easily, making the decision to go based on rationality and logic rather than emotion. Virgos don’t usually gain an excessive amount of weight because they are always active, and they are inclined to exercise even if they don’t enjoy it because they are naturally health conscious and have plenty of willpower. They feel lazy if they are not doing something worthwhile at all times, despite the fact that they tend to achieve far more than most people over the course of any given day. Many Virgos are fussy about food, eating sparingly or only very specific foods. Food sensitivities and aversions often prevent them from eating as much junk food as those of other signs. As a result, most stay relatively slim and fit throughout their lives, unless the ascendant is in a more self-indulgent sign.